What Is Bird Flu (Avian Influenza)? What Is the Cause of Bird Flu? What Are Bird Flu Symptoms in Humans? When Should Someone Seek Medical Care for Bird Flu? What Specialists Treat Bird Flu? What Exams Do Doctors Use to Diagnose Bird Flu? Are There Home Remedies for Bird Flu? What Medications Treat Bird Flu? Is It Possible to Prevent Bird Flu? What Is the Prognosis for Bird Flu? Bird flu (also termed avian influenza or avian influenza A) is an illness that affects wild and domesticated birds that usually causes either little or no symptoms unless the bird population is susceptible, in which it may cause death in many birds within about 48 hours. Bird flu viruses have been isolated from more than 100 species of wild birds and is endemic in many aquatic wild bird species (for example, sea gulls and terns). Bird flu influenza A viruses primarily affect birds and are not easily able to infect people. However, in the late 1990s, a new strain of bird flu arose that was remarkable for its ability to cause severe disease and death in domesticated birds, such as ducks, chickens, or turkeys. As a result, this strain was called "highly pathogenic" (meaning very severe) avian influenza (HPAI, a term seen in older publications). The first human case of illness from highly pathogenic avian influenza was identified in 1997. Human infection with avian influenza is rare (the incidence has been that over 700 human infections have occurred with Asian H5N1 virus, according to the World Health Organization [WHO], in mainly 15 countries in Asia, Africa, Europe, the Pacific Islands, and in the near East) but frequently fatal. According to statistics published by the WHO in 2015 and the U.S. Centers for Disease Control and Prevention (CDC) in 2016, mortality (death) rates from infection with Asian H5N1 have been approximately 60%. Government officials in China announced they detected a new strain of bird flu in March 2013. It was named H7N9 (also termed H7N9 Chinese bird flu). As of November 2016, the WHO reported a total of 800 laboratory-confirmed human cases of H7N9 virus since March 2013. Mortality rates have varied from about 20%-34%. Fortunately, the virus subtypes that have caused bird flu in humans are not easily transmitted to humans. However, health experts are concerned about possible future changes in these viruses that may allow them to become more contagious. Pandemic: A pandemic is a global outbreak of disease. This could occur if a new virus (for example, one which has mutated from an avian influenza virus) that causes serious illness were to emerge among humans (not birds) with the ability to spread easily from one person to another. A pandemic is caused by a new subtype that has never (or not recently) occurred in humans. The last pandemic involving humans was with an influenza virus, H1N1 (often termed the "swine flu"), that occurred in 2009. Epidemic: A fast-spreading, seasonal, or regional outbreak of flu among humans is called an epidemic. Epidemics may lead to pandemics; there have been several bird flu epidemics in poultry (for example, chicken and turkey) in several regions of the world (see below). Birds have been affected with avian influenza in Asia, Europe, the Near East, and Africa, and the outbreak has killed millions of poultry. Bird flu from the highly pathogenic strain was found in the United States in December 2014 and eventually detected in 21 states (15 states with domestic poultry infections and in six states with detection of the virus only in wild birds). No human infections were reported in these U.S. bird flu outbreaks. Human cases of bird flu have largely been confined to Southeast Asia and Africa. However, mutations (changes in the genetic material of the virus) often occur in the virus, and it is possible that some mutations could create a more contagious virus that could cause a worldwide pandemic of bird flu among humans. Fortunately, the mutations that have occurred to date in nature have not made the virus more contagious. Unfortunately, recent research work has been able to introduce genetic material into bird flu viruses that makes these laboratory strains highly transmissible to humans. This information will be discussed in another section. The virus spreads from bird to bird as infected birds shed flu virus in their saliva, nasal secretions, and droppings. Healthy birds get infected when they come into contact with contaminated secretions or feces from infected birds. Contact with contaminated surfaces such as cages might also allow the virus to transfer from bird to bird. Contact with humans occurs in the same way, mainly by flocks of poultry cultivated by farmers that are exposed to wild birds infected with bird flu. Other people are exposed to the bird flu when, for example, infected birds are processed for sale before they are cooked or if they come in contact with contaminated wild bird droppings or dead birds. Bird flu is caused by a types of influenza A virus (for example, H5N1 and H7N9). There are many types of influenza viruses, and most prefer to live in a limited number of animal hosts. Thus, swine flu primarily infects swine, and bird flu primarily infects birds. The seasonal human influenza virus is best adapted to humans. A few rare cases may occur in an accidental host, as when people who have extensive contact with sick birds get the "bird flu." Sometimes, a species-specific flu virus will change (mutate) in a way that makes it easily able to infect other species. If avian influenza mutated to be able to spread easily among people, it would likely cause a serious pandemic. Such a mutation occurred in the so-called "swine flu" virus (H1N1) in 2009 that triggered a pandemic. Humans may get bird flu from contact with infected birds (chicken, for example) or their droppings or surfaces with infected droppings. Human-to-human spread of bird flu may occur but has been very rare so far. However, if the highly pathogenic strains of bird flu (H5N1, H7N9) mutate to allow them to be easily transmitted from human to human, investigators are concerned that a lethal pandemic could occur in humans. The following section shows how in nature these influenza subtypes may undergo genetic changes that could enhance the viral subtype's contagiousness and/or pathogenicity. Influenza viruses have two surface proteins that can be recognized and attacked by the human body's defenses (immune system). The proteins are called hemagglutinin (H) and neuraminidase (N). There are many different types of hemagglutinin and neuraminidase proteins. A recent bird flu had type 5 hemagglutinin and type 1 neuraminidase. Thus, it is an "H5N1" influenza virus type. Another strain of bird flu has two different surface proteins and was termed H7N9. Also, H9 is another avian flu subtype. A person's immune system learns to recognize these surface proteins either by being infected with a flu virus and recovering or by getting a vaccine (flu shot) that contains similar H and N proteins. After that, any virus that infects with the identical H and N on its surface will usually be quickly recognized and stopped, causing either a mild illness or no illness. This type of defense is known as immunity (to a specific viral type). Unfortunately, immunity to one viral type often does not protect against other viral types. Minor changes in the H or N components can allow the virus to evade a person's immune defense. These minor changes are so common that they are almost routinely detected each year. This is why a person can get influenza infections year after year. If the new virus is very similar to older viruses, the immune system may still be of some help in reducing the severity of disease. This is sometimes referred to as "partial" immunity. Major changes in H and N viral proteins are more serious because people have no immune defense at all against the new virus. If the new virus spreads easily from person to person, there is a risk of a worldwide pandemic with a very large percentage of people becoming infected and ill from the flu. One way the avian influenza virus could make such a dramatic change is if it picked up proteins from human viruses through a process known as recombination of genetic material that results in an "antigenic shift." Another way would be spontaneous changes (mutations) in the bird flu virus itself that would make it more infectious; this results in "antigenic drift." These scenarios are what concerns scientists about the bird flu and are shown below for bird, human, and swine flu RNA genomes; these influenza A viruses all follow the same genetic methods that result in new influenza viral types. 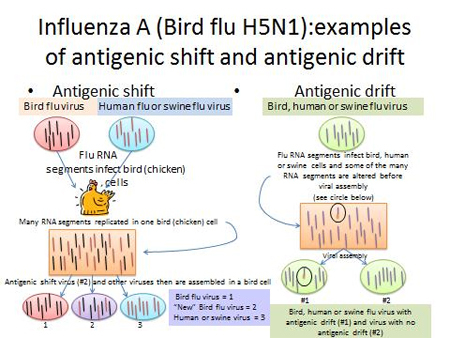 The schematic below shows an example of the antigenic shift and drift for bird flu strain H5N1 but represents the way genetic material is reassembled and altered in all influenza A viruses including the H7N9 bird flu. If such a dangerous virus acquires the ability to spread easily among humans, it could cause a serious health pandemic. Fortunately, this has not happened to date. Although the highly pathogenic strain of bird flu has repeatedly changed over time, person-to-person transmission of bird flu remains very rare. Rare transfer to humans is seen in other non-flu diseases such as mad cow disease. It is hoped that person-to-person transmission remains a rare event for any strain of bird flu. Serious pandemic influenza is uncommon. The deadliest pandemic in modern history was the 1918 influenza, also known as the "Spanish flu" (although it did not originate in Spain). The 1918 virus spread rapidly and killed tens of millions of people worldwide. The risk of mortality (death rate) was especially high in healthy young adults. Although the 1918 virus was a human influenza virus, it had many genes that suggest it had an avian ancestor. Some people also have symptoms of nausea, vomiting, diarrhea, encephalitis (brain infection), and/or eye infections. Children and even animals (dogs, cats, and other mammals) may develop similar symptoms. This infection can progress to pneumonia and respiratory failure. In humans, bird flu has caused a very aggressive form of respiratory flu that has progressed to ARDS (acute respiratory distress syndrome), respiratory failure, multi-organ failure, neurologic changes, and even lethal viral pneumonia in some patients according to the CDC (http://www.cdc.gov/flu/avianflu/avian-in-humans.htm). The incubation period (time from infection to development of symptoms) for H5N1 averages about two to five days (range is 17 days) while H7N9 averages five days with a range of one to 10 days. Although avian influenza viruses are very contagious among wild and domesticated birds, they are weakly contagious in humans, and person-to-person transfer of bird flu viruses is uncommon unless there is very close contact with an infected person (for example, a family member). For any flu-like illness suspected to be due to bird flu virus, call a doctor as soon as possible to see if it is necessary to take an antiviral medication (for example, oseltamivir [Tamiflu]). The medication may shorten the course of the illness or lessen the symptoms. Be sure to mention if you have had any contact with sick or dead poultry or recent travel to an area of the world currently affected by bird flu. Health specialists who may be consulted to treat bird flu in humans include infectious-disease specialists, critical-care specialists, pulmonologists, hospitalists, and others as needed. Experts at the CDC and/or WHO should be notified to perform specialized testing and aid in infection control. There is no way to tell what type of influenza infection a person has without doing tests. In most cases, the presumptive diagnosis of flu is determined by the symptoms, especially when these occur during the peak flu season (late fall and winter in the U.S.). Sometimes, the doctor may need to perform special tests to be sure the seasonal influenza virus is responsible for the disease and not due to H5N1 or other novel influenza viruses. Some doctors' offices may use a rapid test that can be done in the office with the result available in 30 minutes. Some rapid tests detect only influenza A virus, while others can detect both influenza A and influenza B virus types, and some may report unsubtypable influenza viruses or give a result presumptive for novel influenza viruses. These samples are recommended to be sent to the CDC for further examination. To identify whether a virus is present and to test for the type of influenza, a sample is taken from the back of the throat and/or nose. The doctor uses a cotton-tipped wooden stick and simply rubs the cotton tip at the back of the throat and/or inside the nose. Alternatively, samples may be obtained by rinsing saltwater (saline) solution through the nose and throat and transferring the fluid back into a specimen jar. The sample is sealed in a packet and sent to the lab for testing. Also, some cases of flu may be missed by the rapid tests. There are no commercially available tests that specifically detect bird flu. However, Chinese researchers are attempting to develop a test to identify H7N9 viral infections. Again, routine diagnostic tests available in the doctor's office currently cannot determine whether a case of the flu is due to bird flu. The patient's samples would be sent to a reference laboratory (usually through the state health department) for special testing if bird flu is suspected (perhaps because of a known exposure to infected birds). If a patient is in the hospital, the physician may recommend a bronchoscopy, which involves slipping a tube through the mouth or nose into the lungs to aspirate secretions. Most viruses can be identified fairly quickly by polymerase chain reaction (PCR), usually done at the CDC. The virus may also be cultivated in tissue culture and antibodies against it may also be detected in an infected person's serum, but these tests take time. The patient usually has either recovered or died by the time these viral culture tests are done. Influenza is a respiratory infection. There are many recommended self-care techniques to help relieve viral flu symptoms; however, with bird flu, symptoms may progress rapidly and treatment at home would not be appropriate. If you have been exposed to bird flu and develop symptoms, seek medical help immediately and do not attempt to care for the infection at home. Rest in bed. Avoid physical exertion. Avoid using alcohol and tobacco. Drink plenty of fluids such as water, fruit juices, and clear soups. Water should not be the sole or main liquid consumed for prolonged periods because it does not contain adequate electrolytes (sodium and potassium, for example) that the body requires. Commercially available products such as sports drinks can be useful in this regard. For children, oral rehydration solution (ORS) packets are another good way to replenish the body fluids. Treat fever and aches with over-the-counter medications such as acetaminophen (Tylenol is a common brand), ibuprofen (Advil or Motrin are examples), and naproxen (Aleve or Naprosyn can be purchased at most drugstores). Aspirin is not recommended in children or teenagers because of an increased risk of severe liver disease called Reye's syndrome. Always follow package directions. Do not combine medicines with the same ingredients. For example, many sinus preparations already contain acetaminophen and should not be taken together with Tylenol. Cough suppressants, antihistamines, and decongestants should be used only according to package directions. Many of these products have limited effectiveness and may have side effects. The FDA has recommended against the use of these products in children and infants. Steam inhalations may be useful in opening up a blocked nose and thus make breathing easier. Avoid touching hard surfaces where flu viruses may remain alive: handrails, telephones, doors, faucets, and counters. Wash your hands often, especially after being in public places or at work. Cough or sneeze into a soft tissue or handkerchief. Carefully dispose of tissues after using them and wash your hands. Stay away from people who have the flu if possible. If you experience flu symptoms, you should consider staying at home and not going to work or to crowded places in which you might spread the virus. Remember: Bird flu in humans, although rare, once established in a human has been frequently fatal if not treated quickly, so home treatment is not advised if bird flu is suspected. Scientists are hopeful that antiviral medicines like oseltamivir (Tamiflu) might be effective against bird flu in humans. Another drug called zanamivir (Relenza) shows promise in the lab but has not been widely used in human cases of bird flu. Oseltamivir, peramivir, and zanamivir are types of medications called "neuraminidase inhibitors." Side effects include nausea, vomiting, and sometimes nervousness. Zanamivir is an inhaled drug and may make asthma worse. Oseltamivir is given as a pill while peramivir is given intravenously. Some strains of the bird flu have shown resistance to neuraminidase inhibitors, and clinicians may consider adding another drug like ribavirin (Copegus, Rebetol) or amantadine (Symmetrel) in these cases. Oseltamivir, zanamivir, and peramivir are only available by prescription and are recommended by the CDC for treatment of bird flu in humans. If a pandemic occurs, the CDC may authorize distribution of antiviral medications directly to the public. Treatment should begin as soon as possible after symptoms start; if bird flu is suspected, the CDC recommends treatment be started immediately. There is not enough experience to date with these drugs in treatment of H7N9 to know what effect, if any, they will have on this viral infection. A vaccine has been developed and approved by the FDA to protect humans against the H5N1 bird flu virus, although it is not available to the public at this time because the U.S. population has not experienced any bird flu outbreaks. It is unlikely that the H5N1 vaccine will offer protection against H7N9 bird flu. There is some concern that the inactivated viral vaccine preparation (killed H5N1 viruses) may not be as effective as predicted if the virus continues to mutate. The standard flu vaccine developed each year does not protect against these strains of bird flu. Health researchers are currently developing new ways to create flu vaccines that can be rapidly prepared and may give people immunity to a wide range of influenza viruses; these new vaccines (some based on the conserved internal viral proteins) may be available in a few years. A 2013 publication on bird flu vaccine development showed some success in protecting research animals against viruses by immunizing with the N9 antigen, but it has not been tried in humans. New and more rapid vaccine development is becoming available; the FDA approved (January 2013) a recombinant vaccine (Flublok) for treating seasonal influenza that does not use the tedious and time-consuming egg inoculation method for preparation of the vaccine. In the very near future, even with H7N9, researchers may be able to produce a safe and effective vaccine very quickly in large amounts that can be administered if needed to large populations. There is no commercially available vaccine against bird flu strains for humans, but there is a vaccine against H5N1 sequestered by the U.S. government; researchers in China and the CDC are actively researching vaccine development for H7N9. Practice safe food handling practices: As with all meat, including poultry, when handling or cooking, wash hands with soap and water and disinfect all surfaces such as cutting boards and countertops that contact any raw meats. Viruses can remain active in raw meat. Cooking kills the bird flu virus strains in poultry. Prevention also includes poultry-safety measures such as destroying flocks when sick birds are identified and vaccinating healthy flocks. The occasional cull, combined with import bans, has effectively limited the spread of bird flu (H5N1) in outbreak situations but naturally has negative effects on the poultry and egg industry. For example, Chinese health authorities have ordered all chicken flocks suspected to have H7N9 infections to be destroyed and the areas where they were housed or sold sanitized. Get informed about foreign travel: The CDC advises travelers to countries with known outbreaks of bird flu to avoid visiting poultry farms or have contact with live animals in food markets. In affected countries, avoid ice cream or other foods that may have been produced with raw eggs. Do not contact any surfaces that appear to be contaminated with feces from poultry or other animals. Wash hands with soap and water or use alcohol-based hand sanitizers (there are some researchers that suggest hand sanitizers may not work as well as hand washing). Talk with a doctor about bringing along an antiviral medication should you feel ill with flu. For current travel information and health advisories from the CDC, see their Travelers' Health page. The CDC has published what precautions to take to avoid H7N9 when traveling in China. If there is an outbreak of bird flu in people, it is possible that antiviral medications might be recommended for healthy people in the area to try to prevent them from getting infected. CDC and the World Health Organization (WHO) have stockpiled millions of doses of antiviral medications. If an outbreak occurs, the CDC or WHO will make recommendations regarding management, including the need to use face masks/respirators or other personal protective measures. Epidemics or pandemics of bird flu in people would likely result in closure of schools or businesses in affected areas as public health authorities try to limit the spread of the disease. Most communities and hospitals have plans in place to respond to pandemics. The prognosis (outcomes) for bird flu continues to be poor with the death rate reaching about 60% with the N7H9 strain of bird flu, there is reason to believe it, too, could have a high death rate in future outbreaks. Prevention (see above) is the key to a good outcome. The U.S. Department of Agriculture and the CDC have banned the import of certain birds from many Asian countries affected by the H5N1 virus strain because of the potential that infected birds could infect humans. This ban includes both live and dead birds and their eggs. This ban is likely to be modified to include H7N9. Although it is possible that highly pathogenic bird flu may mutate and spread widely to people, it is encouraging that this has not happened in the 16 years since the first human case was identified. The World Health Organization (WHO) continues to monitor public health reports for clusters of people with symptoms that might suggest a flu virus is moving from human to human (and not just from birds to humans). Most articles do not have this section but it is included to give the reader some insight into the problems and dangers of biologic research that may affect their lives. In 2011, at least two major research laboratories (in the U.S. and the Netherlands), while trying to predict what genetic changes needed to occur in avian flu to make the virus easily transmissible to humans, developed a highly lethal avian influenza virus strain that was easily transmissible to ferrets. Unfortunately, for humans, this lab strain could be transmissible to humans by "mistake" since spontaneous transfer of the swine flu (H1N1) has been documented to occur between humans and ferrets in nature (pet ferrets caught H1N1 from humans). Although this lab strain gives researchers a fine model to study viral genetics and viral transmission, many health researchers, clinicians, biowarfare experts, and many others consider such work to be highly dangerous because of the potential, however slight, for the virus to escape the lab by "mistake," or even worse, that terrorists could use the published data to create a biological weapon. Consequently, publication of the data about this potentially lethal strain was delayed until there was some agreement in the worldwide scientific community about how to proceed. This delay was not only for publication but extended to further research work on the viral genome. The work on person-to-person transmission genetics was and still is another major area of concern. An expert panel composed of WHO consultants decided in 2012 that the controversial information should be reported so now many of the details of the research are widely available. How the research will progress remains unclear. What can be done with H1N1 viruses is possible to do with avian influenza viruses, and such laboratory-produced modifications of H5N1 or H7N9 bird flu could have devastating human consequences in the future if they escape from the labs if no vaccine or effective antiviral drugs become readily available. A fever (also termed pyrexia) is a higher-than-normal body temperature. It is a symptom caused by a wide variety of illnesses. Fevers may occur in anyone at any age; however, this article is specifically addressing fever in adults. A fever rarely comes without other symptoms. It is often accompanied by specific complaints, which may help to identify the illness causing the fever. This can help the doctor determine which treatment is necessary. Switzerland. World Health Organization. "Cumulative Number of Confirmed Human Cases of Avian Influenza A(H5N1) Reported to WHO." Mar. 12, 2013. Switzerland. World Health Organization. "Human Infection With Influenza A(H7N9) Virus in China - Update." Apr. 5, 2013. <http://www.who.int/csr/don/2013_04_05/en/index.html>. United States. Centers for Disease Control and Prevention. "Avian Influenza A (H7N9) Virus." Apr. 5, 2013. United States. Centers for Disease Control and Prevention. "Avian Influenza Current Situation." Nov. 22, 2016. <https://www.cdc.gov/flu/avianflu/avian-flu-summary.htm>. United States. Centers for Disease Control and Prevention. "Interim Guidance on Testing, Specimen Collection, and Processing for Patients with Suspected Infection with Novel Influenza A Viruses with the Potential to Cause Severe Disease in Humans." Jan. 26, 2016. <https://www.cdc.gov/flu/avianflu/severe-potential.htm>. United States. U.S. Food and Drug Administration. "FDA Approves New Seasonal Influenza Vaccine Made Using Novel Technology." Jan. 16, 2013. <http://www.fda.gov/NewsEvents/Newsroom/PressAnnouncements/ucm335891.htm>. Van Kerkhove, M.D., E. Mumford, A.W. Mounts, J. Bresee, S. Ly, C.B. Bridges, and J. Otte. "Highly Pathogenic Avian Influenza (H5N1): Pathways of Exposure at the Animal-Human Interface, a Systematic Review." PLoS One 6.1 Jan. 24, 2011: e14582. What prevention measures do you use to avoid getting a bird flu disease?